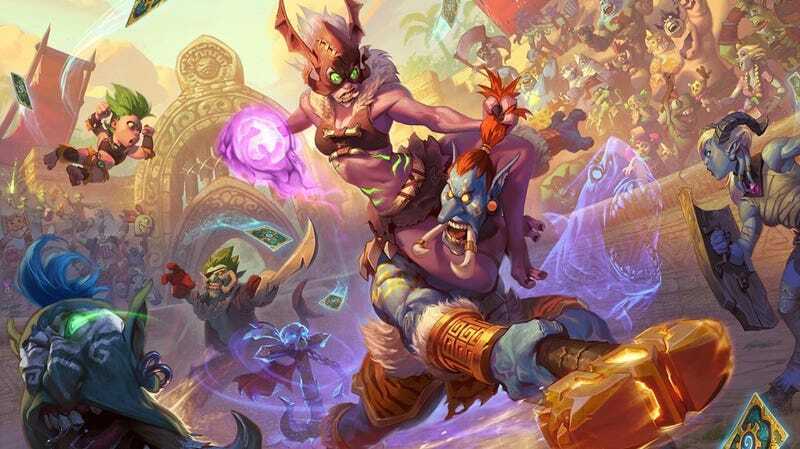 Blizzard has now announced all of the cards from Hearthstone’s upcoming Rastakhan’s Rumble expansion, and once again, it looks like the Hearthstone metagame is in for a huge shake-up once it drops next week. On top of all the new mechanics that the set will introduce, there also seem to be a few cards that are specifically meant to counter strategies that are currently popular in the game’s most powerful decks. Here’s a closer look at what to expect from Rastakhan’s Rumble. Rastakhan’s new Overkill mechanic is pretty much exactly what it sounds like: if an Overkill card deals damage to an enemy minion in excess of that minion’s current health, the effect triggers. In practice, Overkill effects seem pretty good, but since your minion actually has to be able to attack to set off the effect, it seems that many Overkill minions will be doomed to die before they can take advantage of it. One of the worst-looking Overkill cards announced in the set, Arena Patron, is a 5-mana, 3-attack, 3-health minion that summons a new Patron upon overkill. Not only is a 5-mana 3/3 overcosted, it’s easy to kill and will probably never trigger—making it probably much weaker than Grim Patron, the extremely powerful card it’s referencing. It seems the real power of Overkill cards will come paired with the Rush ability, which allows minions to attack other minions on the turn they’re played. The Legendary minion Oondasta is a 9-mana 7/7 with Rush that summons a beast from your hand if you trigger the Overkill effect. Not only are you dealing 7 damage to a minion with Oondasta right off the bat, you’re getting another minion on the board at the same time. A powerful effect, if you’re able to trigger it. Other cards that give minions Rush could work wonders when used in tandem with Overkill. Captain Hooktusk, an 8-mana 6/3 minion, summons three Pirate minions from your deck and gives them Rush. This could pair perfectly with a card like Ticket Scalper, a 4-mana 5/3 that draws two cards on Overkill. The prospect of speeding up Overkill minions with Rush could make the Overkill mechanic even more powerful than it appears—maybe even powerful enough to show up in top-tier decks. Whereas Hearthstone’s previous expansion, The Boomsday Project, centered around Legendary scientists in the Warcraft lore and their accompanying spells, Rastakhan’s Rumble revolves around Legendary Trolls, powerful Legendary minions called Loa, and “Spirit” minion cards that all complement each other to give each class a unique identity. The Legendary Trolls are class-specific minion cards that each boast some kind of massive, class-defining effect. The Paladin Troll High Priest Thekal, for instance, is a 3-Mana 3/4 that converts all but 1 of your current health into Armor. The effect isn’t too powerful on its own, but it opens up exciting possibilities for healing-heavy Paladin decks in the future, and synergizes with other powerful cards from this set like Zandalari Templar and Flash of Light. Loa cards are Legendary animal-based minions that also boast class-defining powers. The Druid Loa called “Gonk, the Raptor” is a 7-mana 4/9 that lets your Hero attack again every time it kills a minion. That’s a weak effect, but paired with other attack power-based Druid cards like Pounce, which gives your Hero +2 attack for a turn, might have some potential. To be honest, attack power Druid seems like a weak archetype overall, but that’s probably a good thing when you consider that the class is already extremely strong. Finally, we have the Spirits, which are 0-attack minions that come into play with Stealth for a turn, and can provide powerful effects while they’re on the board. The Warlock Class’ Spirit of the Bat is a 2-mana 0/3 that gives a minion in your hand +1/+1 every time a minion on your board dies. The effect itself, again, isn’t great, but it might prove worthy when paired with a card like the Warlock Loa Hir’eek the Bat, an 8-mana 1/1 that fills the board with copies of itself when played. Buff Hir’eek with Spirit of the Bat, play him on turn 8, and see if your opponent can wipe the board. There are a lot of cards in this set that are difficult to evaluate just because their effects are so extreme. One Warlock card, Void Contract, blows up half of each player’s deck. There’s a Priest card called Surrender to Madness that destroys 3 of your own mana crystals to give all the minions in your deck +2 health and +2 attack. Another Priest card called Mass Hysteria makes every minion on the board fight another minion at random. And then there’s Mojomaster Zihi, a neutral Legendary minion that sets each player’s Mana pool back to 5—an extremely significant effect that can slow down Druids that love to “cheat” by boosting their Mana pools, and combo-based decks that look to pull off huge one-turn-kills at the end of the game. My personal favorite is Hakkar, the Soulflayer, a 10-mana 9/6 Deathrattle minion that shuffles a Corrupted Blood card into each player’s deck upon death. When drawn, Corrupted Blood deals 3 damage to your hero and shuffles two more copies of the card into your deck, which is an instant death sentence if you no longer have any cards in your deck. As with previous expansions, Rastakhan’s Rumble will see the launch of a new single-player mode called Rumble Run. Not many details have been released, but you’ll be able to choose a Troll champion, each with a different special ability, then run through a gauntlet of bosses while drafting new cards to make your deck more powerful.